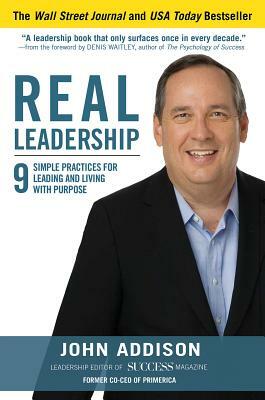 In Real Leadership, author John Addison shares his straightforward practices for successful leadership through his personal and professional journey, helping leaders at any level understand and emulate the nine principles that fostered enduring results on his path to success. As co-CEO of Primerica--the largest independent financial services marketing organization in North America--from 1999 to 2015, Addison spearheaded the company through a period of rapid growth in the early 2000's, then helped navigate the company through the worst financial crisis since the Great Depression, and the separation from their parent company, Citibank, which created one of the most successful IPOs of the decade. Guiding the organization through these monumental changes while also working to keep morale high, Addison developed a passion and talent for motivating others that allowed him to inspire and empower over a million people during his career. The perspectives and personal laws of success that he's developed over decades of hard work and diligence boil down to the principles of living your best life. Because that, says Addison, is the essence of leadership: having the courage, honor, and integrity to live your true life, the one you were put here to live, and to do it in a way that makes the world a better place than it was before you got here. Addison's story shares his experiences--from small-town southern boy to influential CEO--providing a riveting read that is down-to-earth and profound in its simplicity and honesty. His practical takeaway lessons will help you lead better in every aspect of your life. It's the kind of leadership that others will follow over the long haul, through the good times and the bad, through the ups and the downs; it's real leadership. John Addison is the former Co-CEO of Primerica, the largest independent financial services marketing organization in North America. He currently serves as CEO of Addison Leadership Group as well as the leadership editor of Success magazine. As a renowned, world-class speaker, he has motivated millions with his insight and wisdom on leadership, personal development, and achieving success in both their careers and their personal lives. John Addison is the former Co-CEO of Primerica, the largest independent financial services marketing organization in North America. He currently serves as CEO of Addison Leadership Group as well as the leadership editor of Success magazine. As a renowned, world-class speaker, he has motivated millions with his insight and wisdom on leadership, personal development, and achieving success in both their careers and their personal lives. "